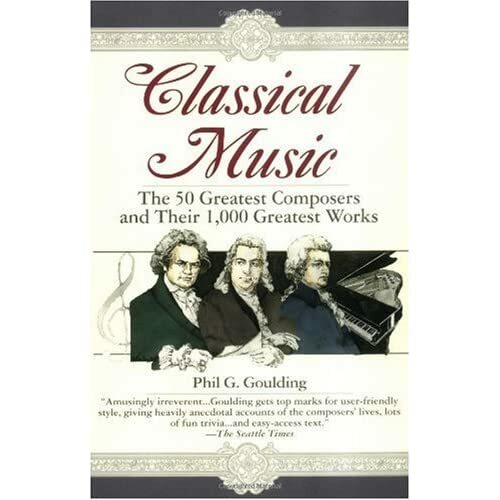 "I have this book, written by Phil G. Goulding, called Classical Music: The 50 Greatest Composers and Their 1,000 Greatest Works. I don't know whether you know this book, but it's an excellent introduction to classical music. Here's the Amazon link for it. Anyway, I made a playlist in Spotify based on his recommendations for each and one of the 50 composers listed. It's comprised of 10 major works. Some are missing, like complete operas from Verdi, Wagner and Puccini, reason being that I'm very well acquainted with them. Some other complete operas are there, though. Initially, I also went after his specific recommendations regarding the recording itself, the conductor and orchestra and all that, but soon i gave that up. Just laziness, I guess. ;)"
Coincidentally, the Chinese translation of Goulding's book was one of the very first books I've read on classical music, and I think it's a good introduction too. If not for Jorge we would not be able to get this wonderful playlist that put the core repertoire of Western classical music in one place. Thanks Jorge. Here's Jorge's Spotify playlist: Phil G. Goulding Classical Music (4685 tracks, 2 weeks) 10 major works each from 50 most important composers according to Goulding, a relatively conservative but very decent list, you will need to know these works well before you go beyond them. As The Dalai Lama says: "Know the rules well, so you can break them effectively." And these are links to mreddington, piaf123456, jahart and bonving who have generously contributed guest playlists before, you can find lots of interesting playlists in their public profiles. Thank you for posting the list, Ulysses. I hope it's as enjoyable to listen as it was to compile it. Why are so many of these albums "currently not available in France" ? Along with Piotr Ilyitch Tchaikovsky, the greatest Russian composer of the Nineteenth Century, Modest Petrovich Mussorgsky (March 9, 1839 – March 16, 1881) was born into a wealthy rural, landowning family. He began by picking out on the piano the tunes he heard from the serfs on his family’s estate. At the age of six, he began to study piano with his mother.